Export Project data and images for school service items, rename image files and more! 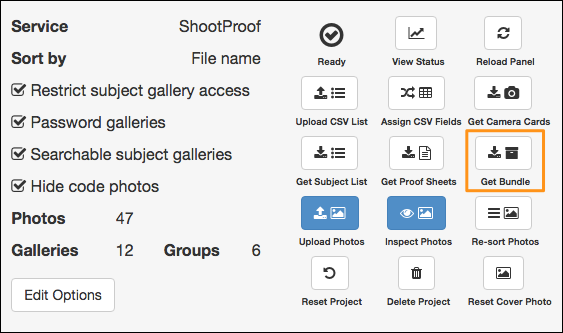 Snapizzi's Bundle feature brings unparalleled freedom to image management and delivery. 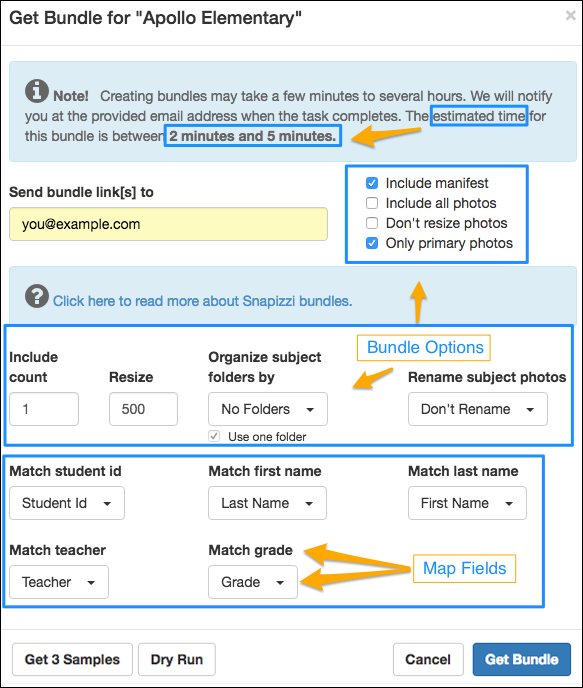 Bundles are packaged collections of Subject image files intended for submission to labs, schools, or any other purpose that fits your workflow. In addition to options for resizing and renaming image files for export, a Snapizzi Bundle gives you the ability to organize the exported images into subfolders based on Project data. You'll end up with a CSV file and Subject images for submission to labs like Miller's that produce these service items. Bundles do not export Group photos. Need to export just the Project data? Request a "Subject List". 1. Select "Get Bundle" for your Project. 2. Select your Bundle options. Include manifest: This is the CSV data file that accompanies the exported image files and is designed for submission to Millers. The Bundle manifest.csv will only contain these fields: Student ID, Name, Teacher, Grade, and Image Filenames. If you need other Project data included, you can request a Subject List and copy & paste any additional columns into the Bundle manifest to suit your needs. Don’t resize photos: Export original file sizes. Only Primary photos: This will exclude any shared or multi-card series. Include count: Number of image files to export from each Subject gallery. Snapizzi starts with the first image in the Subject series unless Snapizzi Stars are used. Resize: Longest side of image in pixels (resizing is proportional). Leave empty to export full image size. Organize Subject folders by: Choose which column to use to group the Project images (class, grades, etc.). Tick "Use one folder" to export all like images into one folder. This means if you choose to organize by grade and tick the box, you'll have a "Grade" folder for each grade that will contain all the Subjects in that grade. Rename Subject photos: Choose how you would like the files named [duplicates will be numerically suffixed]. Leave empty to use original filenames. Match fields: Ensure the data fields are mapped correctly. 3. Snapizzi will export images along with a manifest.csv listing Student ID, Name, Teacher, Grade, and Image Filenames. The Dry Run button will generate just the Bundle CSV file so you ensure your data and filenames are as you expect them to be. This will save you the time of waiting for the images to be resized and/or renamed, only to find out something wasn't set up properly and then having to request it again. Bundles will be exported as one or more standard ZIP files with a maximum size of 500MB. Depending on the Project size, this process could take several hours to complete and then may take several hours to download depending on your connection. We'll email you when the export is complete and ready for download. Once generated, bundle files will be kept for 72 hours. However, you can generate as many versions as needed. If your workflow calls for a text file, simply change the manifest.csv to manifest.txt.